INCA TRAIL, PERU – In the vicinity of Machu Picchu there appear to be two locations commonly referred to as Llactapata: one is a site about 5 km (3.1 mi) to the west of Machu Picchu, and visible from the “back side” of those ruins near the Quarry if you know where to look; while the other is a site some 15 km (9.3 mi) to the south east of Machu Picchu, at the confluence of the Urubamba River and the Sisaypampa. Both sites have been commonly known as Llactapata; both sites have Incan ruins; both sites are on different stretches of an Andean Mountain trail known as The Inca Trail. 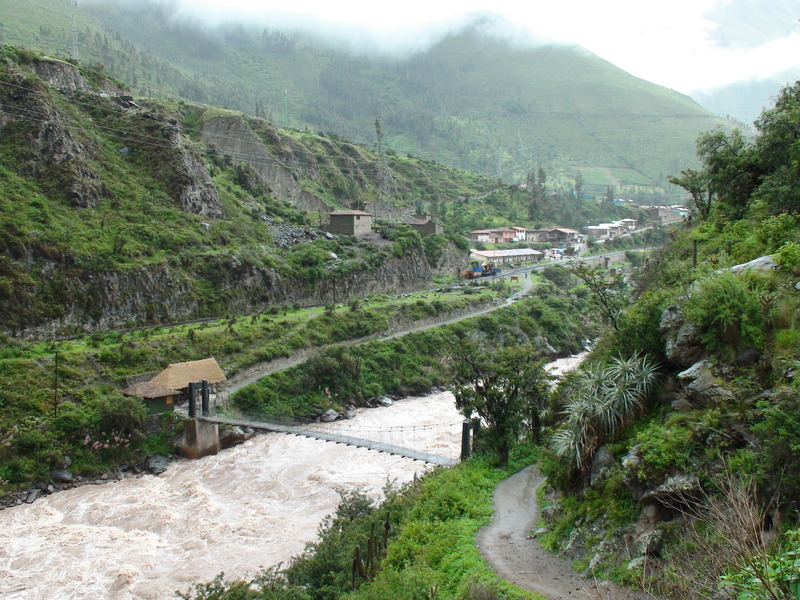 The first day’s trek on the classic Inca Trail to Machu Picchu leaves from the main checkpoint and crosses a bridge over the Urubamba River, near a village named Piscachuco on the rail line at Kilometer 82, sandwiched between steep flanks of the Andes and the raging river. It’s there where the little market sells your supply of coca leaves for the trip in a neat little green plastic bag. The bridge and checkpoint are down river from the village about a quarter mile. 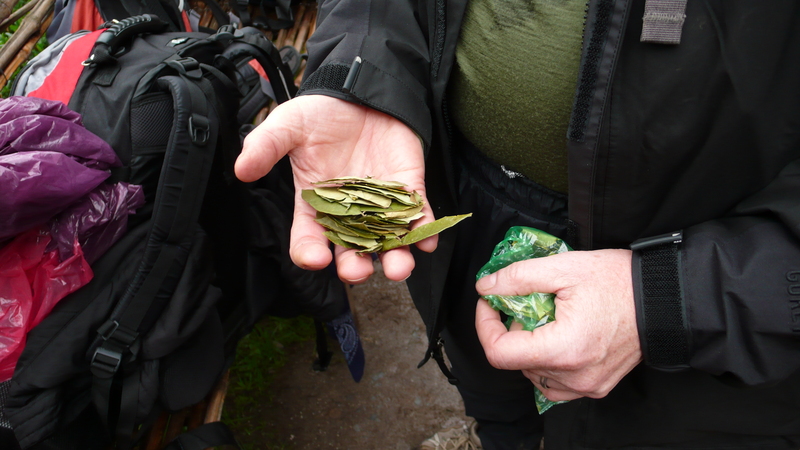 Coca leaves, highly recommended for high altitude hiking. Literature provided by Llama Path, the outfitter/guide we retained, and the research material each of us had read, informed much of the experience we were about to take. Our guide Julian, who had been a guide for over ten years and walked the trial five hundred times, added another layer of quality information as the trek unfolded. Julian would pause and explain a vista, a ruin or the plants along the trail in good, but heavily-accented English. I liked practicing my Spanish with him and the porters in camp and along the trail. After crossing the bridge, the first day begins with a leisurely walk along the southwest side of the Urubamba River through villages and hamlets, fields and farms. Uphill from the trail, one can catch a glimpse of herdsmen and flocks on the steep slopes. The landscape is lush due to the river and the moisture in the air. We are, also, in the prime rainy season – a fact not lost on us as the miles slipped away underfoot. Julian points out some gloriously-blooming plants along the trail and tells us they are hallucinogenic. We fell like we have stepped into another world. Hallucinogenic blooms and misty slopes loom over a surrealistic start to the trek! 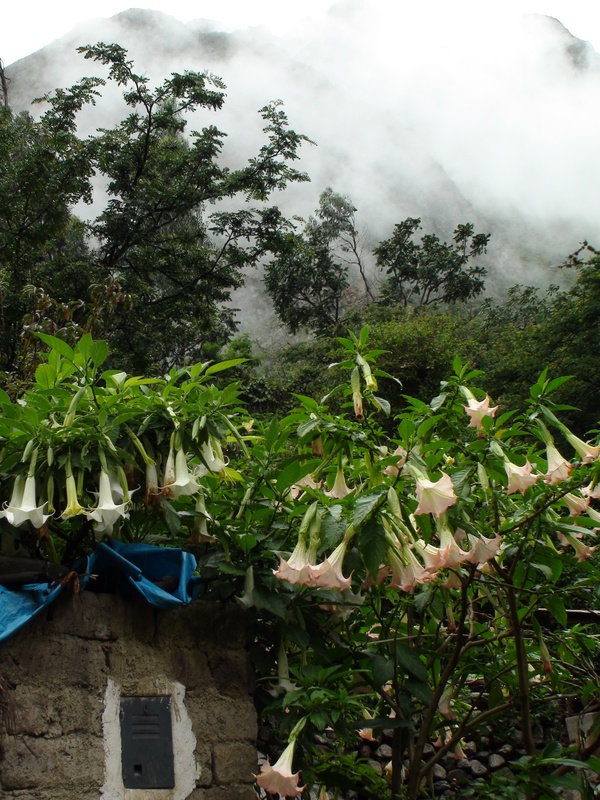 Our guide points out a lush, blooming pant covering a small hut on the side of the trail: The droopy, gorgeous Angel Trumpet (Brugmansia), native to regions of South America, packs a powerful punch of toxins containing atropine, hyoscyamine, and scopolamine. He attributes hallucinations to the use of this plant, but it is far more than that. As documented in the 2007 VBS.tv documentary “Colombian Devil’s Breath“, criminals in Colombia have extracted scopolamine from the plant and used it as a potent drug that leaves victims unaware of what they are doing but entirely conscious. Scopolamine can be absorbed through the skin and mucous membranes, allowing criminals to simply blow the powder in a person’s face. The documentary is filled with scopolamine-related horror stories, including one account of a man moving all of his possessions out of his apartment (and into the hands of his robbers) without remembering any of it. This chilling description reminds of the Walking Dead, a real-life zombie poison! Soon the trail traces up the first of many hills and slopes to come. There’s a flat mesa ahead of us, part of an alluvial fan that slipped off the steep slopes to our left and was now a hill above the river. I could see the top had been prepared for planting and there were men working in those fields. The trail took us up to that mesa and beyond, to what would be our first good view of an Inca ruin from the trail – at the juncture of a stream coming down from the slopes of Salkantay to our left (southwest) and called the Sisaypampa, and the Urubamba River, a strategic spot for an Inca trade and civic center. We were far above that ancient city, its ruins terraced up the flanks of the pointed hunk of mountain that split the two streams. Julian gave us a little lecture on the significance of this first “Inca City”, which he called Llactapata, from a beautiful flat bench along the side of the trail. Julian explaining the significance of the location for this Inca city, at the confluence of the two rivers. 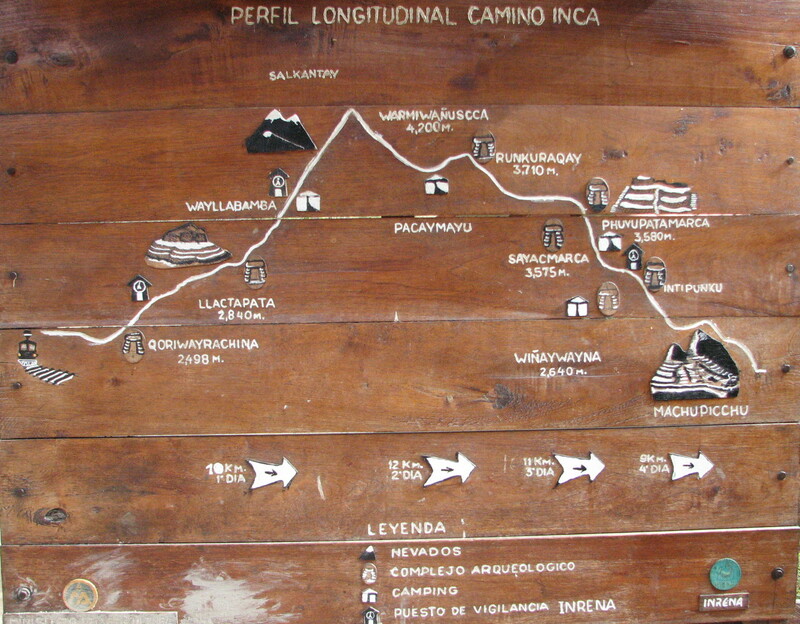 There are even official signs painted and placed along the Inca Trail that specifically call the first ruin along the trail after the start at Piscachuco “Llactapata”! Detail of sign at Inca Trail checkpoint, clearly indicating name of ruin was “Llactapata”! It wasn’t until returning from the journey, actually a couple of years later, that I uncovered this mystery surrounding the two places named Llactapata. You see, there’s another ruin in this region with that name. The other place called Llactapata is also on the Inca Tail, but on a branch far away from the one we were on that day with Julian. The other Llactapata sits on a ridge with a panoramic view across a valley to Huayna Picchu and Machu Picchu, and isn’t as massive as the ruined city now laid out at our feet. As far as we knew, and for some time thereafter, these ruins that Julian showed us on the way to Wayllabamba were the Inca ruins known as Llactapata. However, relying on the accounts from the original discoverer of Machu Picchu, Hiram Bingham, we found that the name of the place Julian showed us should actually be Patallacta! 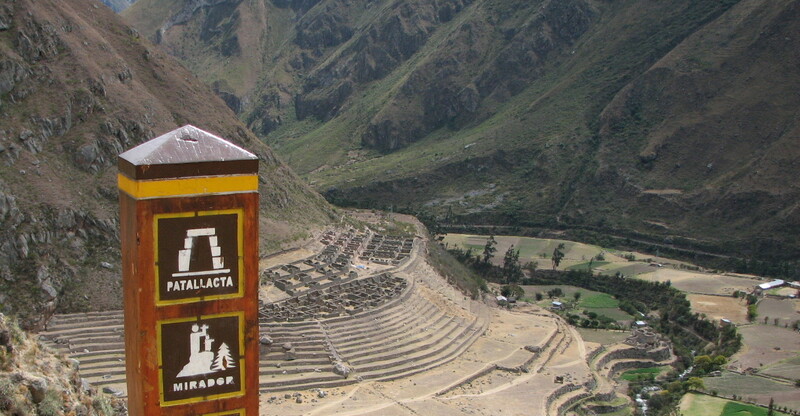 According to Bingham, who passed Patallacta on his exploratory adventure to find Machu Picchu, this place sometimes is given the name of Llactapata – as evidenced by the photograph above of a sign at a check-point along the Inca trail. According to Bingham’s writings, Llacta Pata is a descriptive term: “llacta” means “town” and “pata” means “a height”. Thus, more than one site has been, and is, referred to by this name. Here was the answer to the mystery! His associate Mr. Herman Tucker reported that the name of the large Inca ruin next to the Urubamba River was actually Patallacta, commenting that it contained about one hundred houses, a better match for this first major ruin we studied on the trail. This name was confirmed by archeological work in the area years later by Ann Kindal. Had we seen this sign post on our journey, it would have raised a few questions and created some interesting conversation, I am sure. I can’t imagine how we missed it, our photos look to be taken from the same spot off the trail. 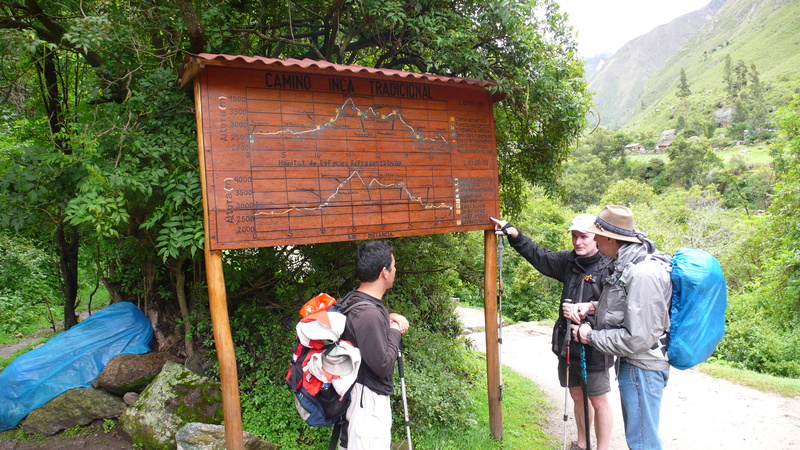 Official signpost along the Inca Trail….whoops! 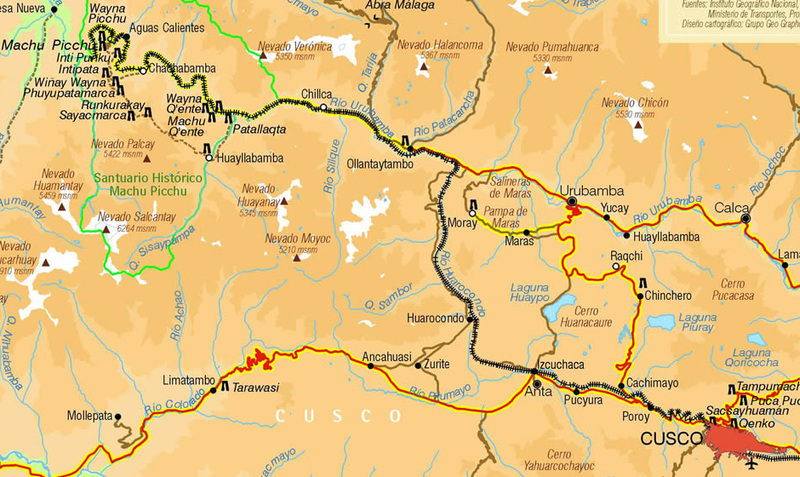 Patallacta was burned by Manco Inca Yupanqui, who destroyed a number of settlements along the Inca road system during his retreat from Cusco in 1536 to discourage Spanish pursuit. 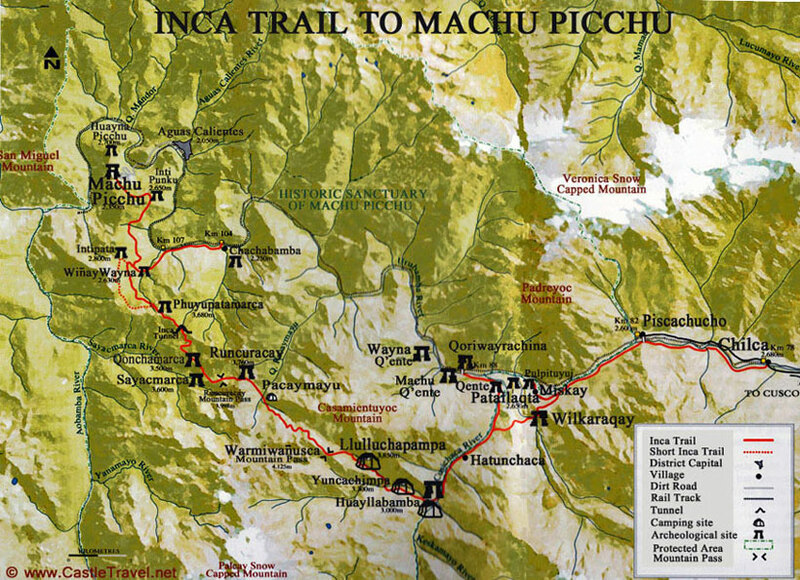 In part due to these efforts, the Spanish never discovered the Inca Trail to Machu Picchu or any of its settlements. Above that ruin, were several important sites including Wayllabamba, our night’s destination camp, on the banks of the Sisaypampa. The “real” Llactapata was a smaller, more elite establishment, higher in elevation and with better vistas. 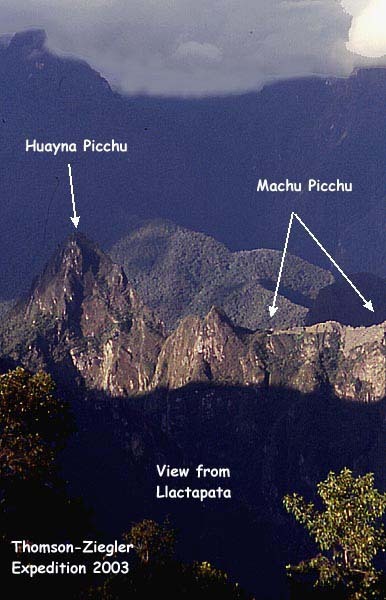 The Llactapata on the ridge to the west of Machu Picchu (at: 13°10′32″S 72°35′10″W) appears to be the site originally reported by Bingham as having this name. Although the site was little explored by Bingham, it was more extensively explored and mapped by the Thomson and Ziegler expedition of 2003. View East to Machu Picchu from the ridge where the real Llactapata rests. Hiram Bingham first discovered the real Llactapata in 1912. 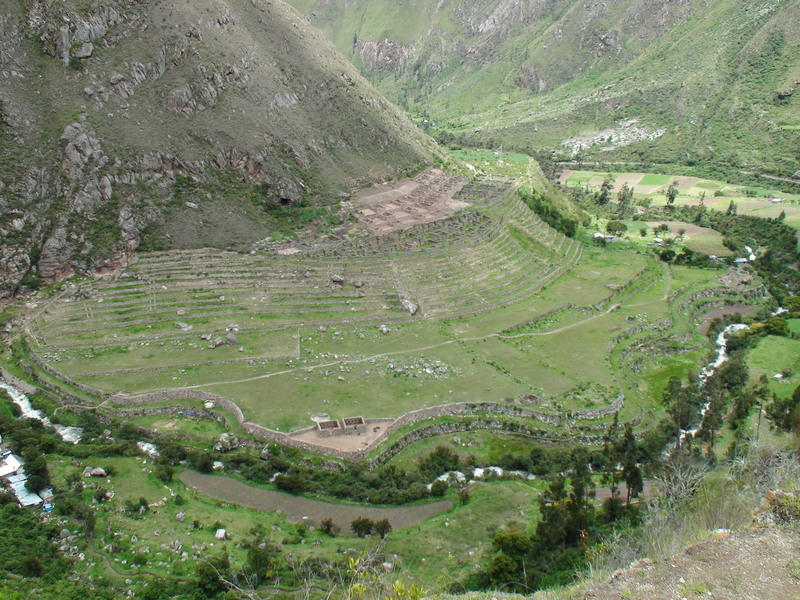 “We found evidence that some Inca chieftain had built his home here and had included in the plan ten or a dozen buildings.” Bingham locates the site “on top of a ridge between the valleys of the Aobamba and the Salcantay, about 5,000 feet above the estate of Huaquina” and said, “Here we discovered a number of ruins and two or three modern huts. The Indians said that the place was called Llacta Pata.” This is much smaller than the trade center at Patallacta down in the Urubamba River valley. Bingham did not investigate the ruins thoroughly, however, and they were not studied again for another 70 years. A mid-2003 study of the site conducted by Thomson and Ziegler concluded that Llactapata’s location along the Inca trail suggested that it was an important rest stop and roadside shrine on the journey to Machu Picchu. The complex is located some four to five kilometers west of Machu Picchu high on a ridge between the Aobamba and Santa Teresa drainages. Llactapata may have been a member of the network of interrelated administrative and ceremonial sites which supported the regional center at Machu Picchu. It probably played an important astronomical function for the Inca during solstices and equinoxes. 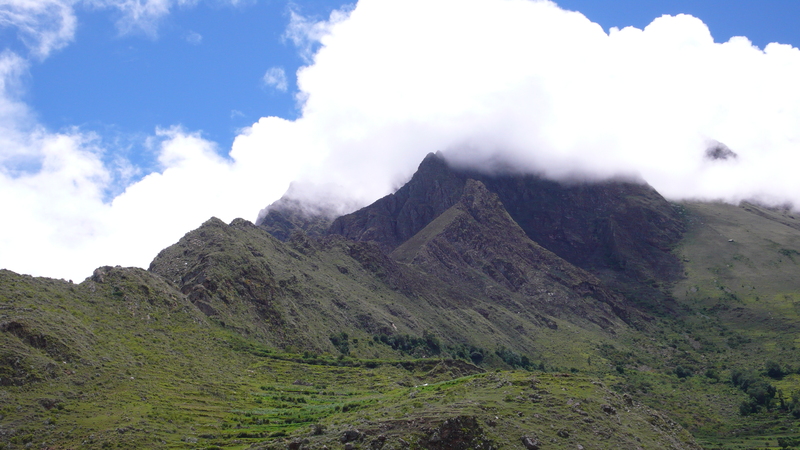 This 2003 Thomson-Ziegler exploration and subsequent investigations have revealed an extensive complex of features related to and connected with Machu Picchu by a continuation of the Inca Trail leading onward through Llactapata and into the legendary Vilcabamba region. Vilcabamba was a city founded by Manco Inca in 1539 and was the last refuge of the Inca Empire until it fell to the Spaniards in 1572, signaling the end of Inca resistance to Spanish rule. 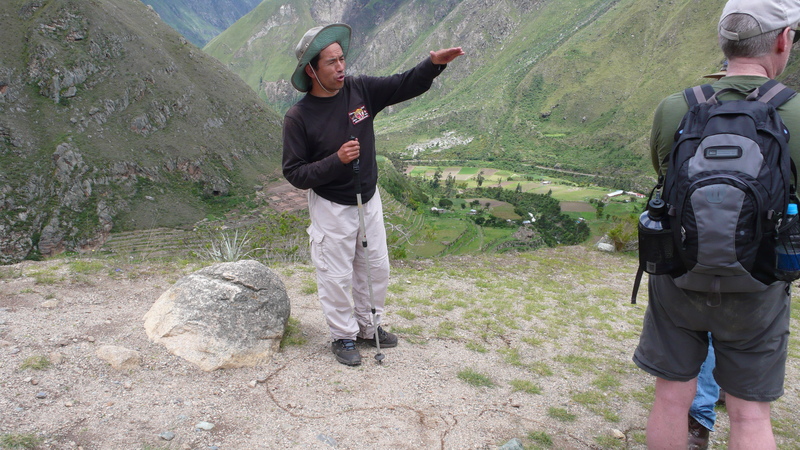 Extensive archeological work by Vincent Lee, and especially his exhaustive study, “Forgotten Vilcabamba” in 2000, gave further and even more precise confirmation that has made the ruins known as Espíritu Pampa the definitively accepted site of the historical Vilcabamba. ~ by Dave Etzold on June 16, 2012.